Earth's End: Announcing Moa by James Davidson! 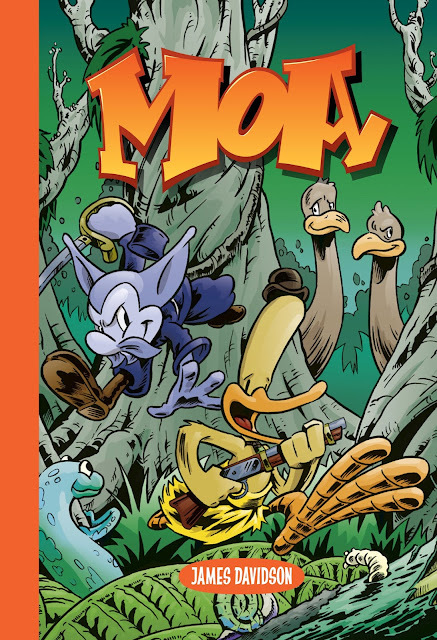 Above: The cover for Moa by James Davidson. Copyright James Davidson 2017. Earth's End Publishing is proud to announce our latest release, a collection of James Davidson's acclaimed children's comic book series, Moa. Set in colonial New Zealand, Moa chronicles the wild adventures of the Moa Rangers, Kiwi Pukupuku and Possum Von Tempsky, defenders of our native forests. 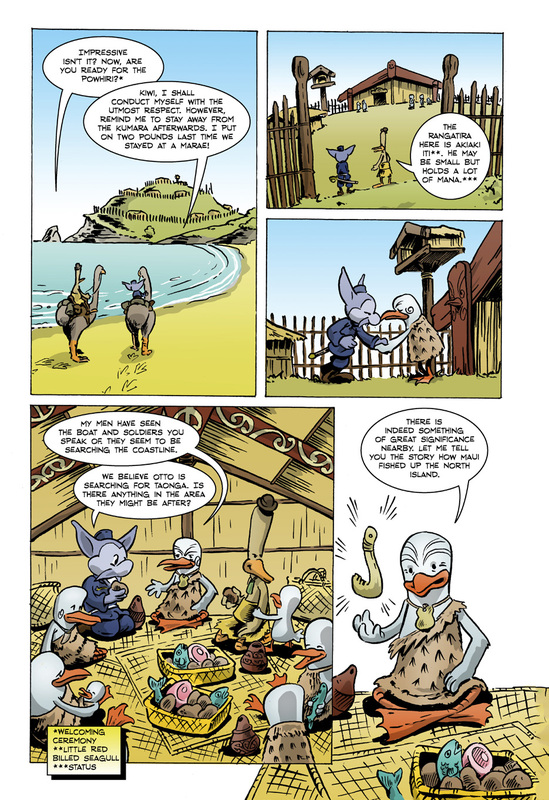 Moa combines the fun and humour of classic Disney comic books with New Zealand's historical past and Maori mythology to create a classic adventure series sure to delight and entertain readers of all ages. This deluxe treasury collection contains the complete Moa story in a hardback edition that is destined to become a family favourite. 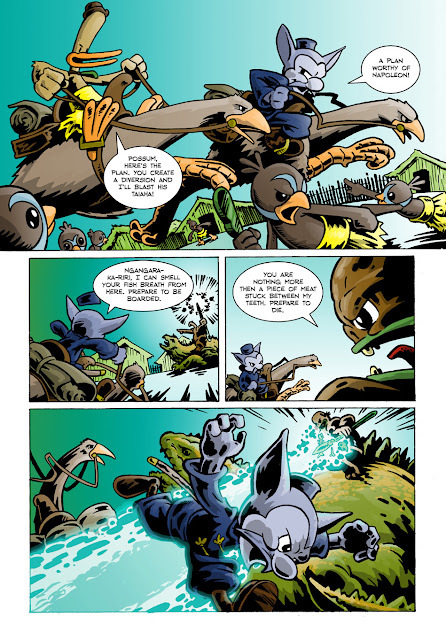 Above: Artwork from Moa by James Davidson. Copyright James Davidson 2017. James Davidson is an educator, serving as the Head of the Arts Faculty at Opunake High School. Moa has been a way for him to explore the layered history and mythology of New Zealand through the medium of comics, and to create stories that can entertain and educate kiwi kids about the land they live in. "Moa is hands-down my favourite New Zealand comic book, and being able to bring James' wonderful stories and characters to a wider audience of kiwi kids is exactly why we formed this publishing house," says Earth's End Editorial Director, Adrian Kinnaird. "As an educator James knows his audience and how to appeal to their sense of fun. It's going to be a real treat to see young readers discover the adventures of Kiwi and Possum, a comic series that could take place in their own backyard." Moa will be released in April 2017, and will be debuting with an exclusive author signing at the Chromacon Arts Festival, held April 8-9th at the Aotea Centre, Auckland. When a sacred Maori treasure is stolen by the dastardly Otto, it's up to the Moa Rangers, Kiwi Pukupuku and Possum Von Tempsky, to return the taonga and save the day! Ride along with Kiwi and Possum on their side-splitting adventures battling mythical creatures and dangerous hunters in colonial New Zealand! Copies of Moa are now available for order from Earths End Publishing. Email: earthsendpublishing@gmail.com. Please do not hesitate to contact us if you have any queries or require further information. You can also follow us on Twitter: @EarthsEndComics and Facebook: www.facebook/EarthsEndPublishing. "It's the type of book that ought to be in every single school library, every public library children's section and ideally in every bookshop in the country. 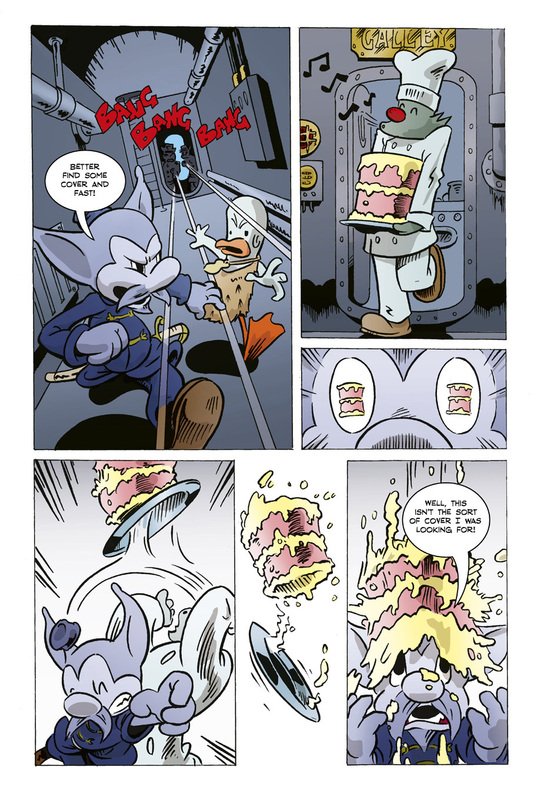 I'm really excited by it, to me it's the first time we have had a good, all-ages, New Zealand comics series since the days of Terry and the Gunrunners in the 1980s."